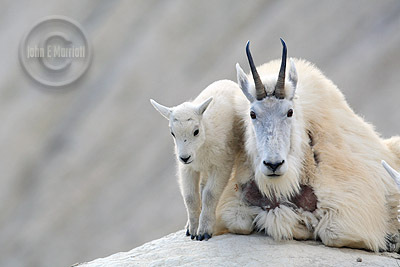 In recent weeks, I have been emailed several times with requests for tips on where to see and photograph mountain goats in the Canadian Rockies. These amazing climbers are well represented in the Rockies, with healthy goat populations in Yoho, Kootenay, Banff, and Jasper, as well as in many of the provincial parks. The best time of year to view goats is in the late spring (May-June) when they come down to the valley bottoms to escape the late snow and visit salt licks. Tangle Hill in Jasper National Park, where the photo above was taken, is an excellent place to see goats right along the roadside, as they frequent the rocks and cliffs in this area for most of the spring. Tangle Hill is located right along the Icefields Parkway, 5 kilometres north of the Columbia Icefields Center. Young goat kids with their moms can often be found at Tangle Hill in mid to late June, as well as further north on the Icefields Parkway at the Kerkeslin Goat Lick. 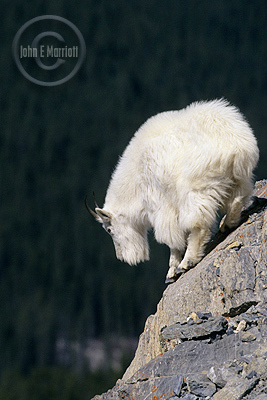 This is an unsigned pullout approximately 40 km south of the Town of Jasper and is a superb location for mountain goat photography. 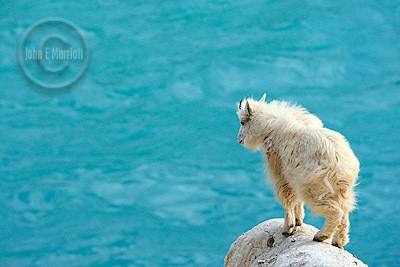 Other good areas to photograph mountain goats include Opabin Plateau in the Lake O’Hara region of Yoho National Park (incredible backdrops for goat photography), the back end of Lake Louise in Banff National Park, and the goat lick approximately 8 km north of Vermilion Crossing on the Kootenay Parkway (93 South) in Kootenay National Park. I understand june is the best month, but can mountain goats be seen at these locations in the fall. Or, are there other better locations for fall viewing? Hi Steve, you can definitely still find the goats at these various locations in the fall. It’s not as reliable, but they do still visit occasionally. Your best bet for fall would be Tangle Hill (just north of the Columbia Icefields) on the Icefield Parkway, or Lake O’Hara in Yoho National Park (hiking only).